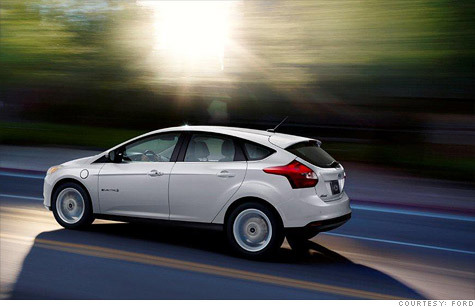 The Ford Focus Electric is priced a few thousand dollars more than the Nissan Leaf. NEW YORK (CNNMoney) -- Ford has begun to take orders for its first plug-in passenger car, the Focus Electric, in New York, New Jersey and California. The car's price will start at about $39,995, about the same as General Motors' (GM, Fortune 500) Chevrolet Volt. But unlike the Volt, the Focus Electric is a purely electric car. While the Volt can only go about 35 miles on a fully charged battery, according to EPA estimates, it has a gasoline engine to provide power for driving longer distances. Because purely electric cars' driving range can vary depending on weather conditions and driving style, drivers may worry about getting stuck without a charge, something that has been called "range anxiety." Ford has said the Focus's range will be "competitive" with that of the fully electric Nissan Leaf, which can go about 73 miles on a charge, according to EPA estimates. Prices for the Leaf start at about $35,000. All three cars are eligible for a $7,500 federal tax credit and, in some cases, local and state incentives, as well. The Focus Electric can be charged in just three hours using a 240-volt charging station, according to Ford. The automaker boasts that it's half the time it takes to charge the Leaf. Ford (F, Fortune 500) has called the Focus Electric "a dynamic driver's car," saying it will have a top speed of 84 miles per hour and the same suspension, steering and brakes as the gasoline-powered car. Standard features in the Focus Electric include an eight-inch computer touchscreen, a rear camera, parking sensors and a mobile phone app for remotely scheduling and monitoring charging, among other uses. The high level of standard equipment in the Focus Electric make its price comparable to a fully loaded Nissan Leaf, according to Ford spokesman Octavio Navarro. Availability of the Focus Electric will expand to 15 more states next year, Ford said, as part of a controlled roll-out of the car. The Focus Electric will be Ford's second plug-in vehicle. The Ford Transit Connect Electric is currently for sale and lease to businesses. The higher price of the Ford, relative to its Japanese competitor may hurt it with some customers, said John O'Dell who covers "green" cars for the automotive Web site Edmunds.com. But Ford's bottom line is unlikely to suffer much as a result. "At this stage in the game, I don't think it's really problematic," he said. For now, those who want electric cars are keenly interested for reasons beyond mere economics, O'Dell said, and automakers aren't producing very many so price is less of an issue. Besides, given the technology costs, the cars themselves aren't big money-makers for the car companies. Instead, they're image-makers. "There's a little bit of a halo effect with these cars," O'Dell said. "They do get people to come and look." In the same way that the Chevrolet Volt has been credited with boosting sales of the similarly-sized Chevy Cruze, the Focus Electric may pull in customers who drive away in a gasoline-powered Focus. Actual deliveries of the cars will begin in March.